Blast Off Into a New School Year with Jet Propulsion of Ready Jet Go! 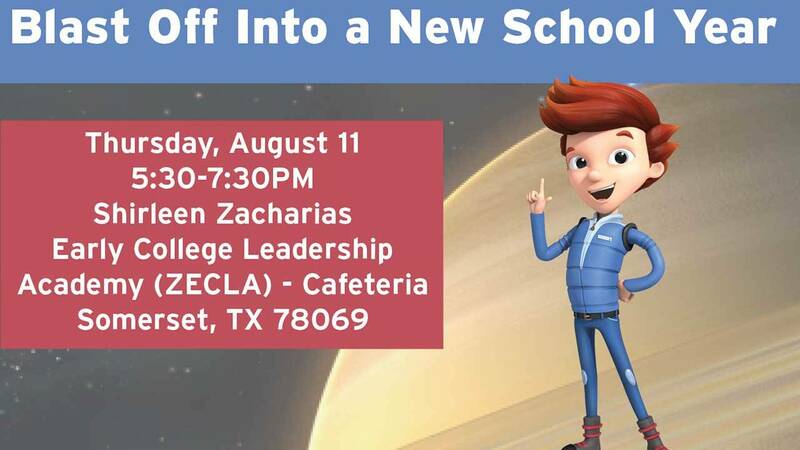 KLRN, Somerset ISD and The City of Somerset host a free event as we blast off into a new school year. The back to school event will be held on Thursday, August 11, 2016 from 5:30 p.m. to 7:30 p.m. at Shirleen Zacharias Early College Leadership Academy (ZECLA) - Cafeteria, 7790 E 3rd Street, Somerset, TX 78069. This is the first ever back to school event for the city of Somerset. Families will enjoy hands-on activities from over a dozen agencies including Region 20 and Boys Town of Texas, a screening of the Ready Jet Go episodes “The Grandest Canyon and A Visit to the Planetarium” and a special appearance by Jet Propulsion of Ready Jet Go. Families will have an opportunity to visit numerous informational tables sponsored by non-profit organizations and community partners. WHAT: Blast Off Into a New School Year with Jet Propulsion of Ready Jet Go! WHEN: Thursday, August 11, 2016 | 5:30 p.m. - 7:30 p.m.